During the summer of 2010, the Alaska Region of the National Park Service (NPS), through its Abandoned Mine Lands program, with funding from the American Recovery and Reinvestment Act, initiated the process of physically closing dangerous mines at Radovan Gulch, located in Wrangell-St. Elias National Park and Preserve. Before NPS personnel could begin sealing adits, the agency had to comply with the National Historic Preservation Act, and determine if the properties were eligible for listing in the National Register of Historic Places. After fieldwork and archival research, an interdisciplinary team determined that the camps, prospects, artifacts, roads and trails at Radovan Gulch maintained historical integrity, and were historically significant on a local level. But the story went far beyond compliance; the examination of the site revealed a remarkable time capsule, preserving the life and work of an enduring copper prospector, Martin Radovan. Martin Radovanovich departed Croatia for the United States in 1900, when he was 19 years old. He arrived at Ellis Island, where his surname, 'Radovanovich' was transliterated to 'Radovan'. He gained railroad experience in New Jersey and in California, and after the 1906 San Francisco earthquake, Martin moved to Seattle. While there, Martin learned of a railway being constructed into the Interior of Alaska by two giants of American business: J.P. Morgan and the Guggenheims (M. Radovan ca. 1974). Martin arrived in Cordova, Alaska in 1908, and found work building the Copper River & Northwestern Railway. After completion of the railway in 1911, Martin stayed in Alaska. He worked as a machinist for Kennecott Copper Corporation, and, eventually, took a job with a hydraulic mining company at Dan Creek, south of present day McCarthy in the Nizina mining district, where he began prospecting nearby creeks and benches for gold. In the 1920s, Martin began searching for copper in an ice-filled cirque on Glacier Creek, a tributary of the Chitistone River, later named Radovan Gulch in his honor. By the late 1890s, copper was a coveted metal, made increasingly valuable by America's desire for electric power. In 1900, Kennecott's world-famous Bonanza copper deposit was discovered in the Chitistone Limestone above the Nikolai Greenstone, a formation that dominates much of the visual landscape on the south side of the Wrangell Mountains (Winkler et al. 2000). Federal geologists and successful prospectors encouraged others to look for copper where the two distinctly colored rock types met (Moffit et al. 1911). Martin Radovan, like nearly all the copper prospectors working the Nizina district for years before him, began to scrutinize every accessible linear foot of the contact zone. Martin gained notoriety as a prospector when he laid claim to the Binocular prospect, a copper outcrop above the greenstone-limestone contact, high on the face of a cliff overlooking a glacial cirque. The U.S. Geological Survey had known about the outcrop, and had studied it - through binoculars - since the turn of the century. The vertical face of the cirque wall, and the location of the outcrop, over 3000 feet up, had prevented geologists from inspecting and sampling it. In 1929, the Kennecott Copper Corporation, always looking for more ore in the Nizina district, sent European mountain climbers to try to reach the Binocular prospect. After a summer of attempts, the climbers failed to reach the contact (Casley. 1972). Martin managed to do what Kennecott could not. He reached the Binocular prospect by following a precipitous route along the cliff wall toward the target. Martin was supported in his endeavor by his wife, Augusta Louise Iverson, a person of great significance in Martin's life. Somehow Martin, a brown-eyed, black-haired Croatian, who spent more time in a tunnel than in town, caught the attention of an attractive Norwegian bookkeeper who worked at the Kennecott Milltown. Martin and Augusta were married in McCarthy in 1914. Moving seasonally between the cabin at Dan Creek and the camp at Glacier Creek, she made a life with him in the Nizina country. 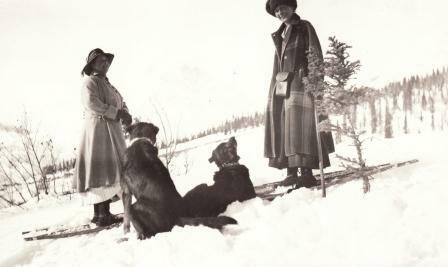 Augusta not only helped Martin build the steep trail to the Binocular prospect, but it was her professional skills and steady income that allowed Martin to spend his time prospecting at Dan and Glacier Creeks. While Martin remained steadfast in working his surrounding claims, Augusta interacted with the larger community of miners and their wives. Augusta fished, baked bread, sluiced for gold, cut wood, called on neighbors and friends, traveled to town, usually on foot, scheduled daily life around the mail, and had a naturalist's eye for wildlife. Besides working at Kennecott from time to time, she supplemented their earnings by running the Blackburn roadhouse with Martin during the Chisana gold rush, washing miners' laundry, and assisting as the local postmistress and notary. Though her income was not high, she still managed to send money to her mother in Seattle. Martin also took part-time jobs when money ran short. Although their daily routine was gender-specific, Martin and Augusta shared a common vision. She not only made his dream possible, she believed in it, too (A. Radovan. 1930). Augusta died unexpectedly in 1944, but Martin continued his search for copper for the next three decades. Besides the Binocular prospect, he discovered and staked other claim groups: the Low-Contact, the Greenstone, and the Triassic. He built a substantial camp on the banks of Glacier Creek near the mouth of Radovan Gulch. Alone and unaided, he hauled 400 feet of 3/4 inch steel cable six miles upriver on a hand sled and then succeeded in stretching it 325 feet across Glacier Creek for a tram he built to pull himself across to his creek-side camp (Edwards. 1965; Sykes. 1980; Green. 1994; Smith. 2006). By a twist of fate, Martin was reunited with his long-lost brother Jack Radovich of Delano, California in 1951 (Anchorage Daily Times. 1951). Jack, a wealthy vineyard owner, flew to Glacier Creek in hopes of reuniting with his brother Martin, whom he had not seen in fifty years. Jack wanted his Sourdough brother to return with him to Delano, but the family reunion did not deter Martin from his mining aspirations. After a string of disappointing leases and business arrangements between the 1950s and the late 1960s, the Geneva-Pacific Corporation purchased Martin's prospects in the early 1970s, giving Martin hope that the Binocular prospect would finally be mined, and his life work validated. 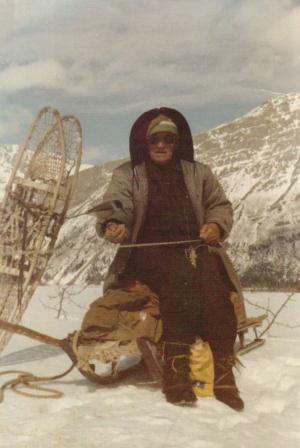 In 1974, at age 91, Martin left Alaska to spend time with his family. The following spring Geneva-Pacific reached the Binocular prospect using a helicopter. Before the company's findings were reported, Martin died. In their report, the sampling team stated that they were stunned to have discovered tools used in 1929 by Martin Radovan at 7,000 feet (Geneva Pacific. 1979). Today, Martin Radovan's life continues to intrigue students of frontier Alaska. The Binocular story has inspired popular articles, chronicling Martin's life at Glacier Creek. He has left his name on the map, and geology reports tell and retell the story of the Binocular prospect, perpetuating Martin's feat in the collective imagination. Still, since Martin Radovan's death in 1975, Radovan Gulch has been abandoned. Over the past 35 years, natural weathering has damaged the structures, many beyond repair. During a routine site assessment in 2010, NPS researchers observed many deteriorated buildings. Unless the remaining structures are stabilized, they will collapse in the near future. Significantly, the site has not been disturbed by vandals, and Martin's possessions at the camp and adits remain much as he left them. These artifacts connect the place to the person and his lifestyle, and even the ruins present clear evidence of the prospector's presence. Thus, the seemingly valueless things Martin left behind provide us fresh insight into the park's mining past. In many ways, Martin's life at Radovan Gulch fits a frontier image of a rugged individual, but Martin never lived independently of the outside world. Though Martin lived seemingly isolated in his wilderness home, he consumed canned foods purchased through an industrial network that connected Radovan Gulch to distant markets. He used Gillette shaving cream, wallpapered his cabin, and seasoned his food with spices from around the world (Spude et al. 1984). He remained a creature of an industrialized economy, taking trains or planes to towns like Cordova, Chitina, Kennecott, and McCarthy, towns that replicated the material, institutional, and ideological culture of rural America. Rather than evading civilization, Martin fully participated in an industrial process that transported twentieth century American life into the heart of Interior Alaska. Still, unlike many who left Alaska with dashed dreams, Martin stayed. Even after Kennecott abandoned its mines and railway in 1938, after McCarthy deteriorated into a ghost town, and after Augusta's untimely death in 1944, Martin remained at Glacier Creek. Immersed in a perilous landscape day after day, Martin picked through tons of rock and, over time, came to know in profound ways the natural environment between his creek-side camp and his tunnels dug deep in the mountainside. By employing rudimentary tools and near-obsolete technology, Martin perfected climbing, construction and prospecting skills at Radovan Gulch that inspired awe and respect from people who knew him. The Binocular prospect, although it never produced ore, reflects Martin's courage, his ingenuity, and his position as the little guy, pitted against one of the most financially successful operators in Alaska history. Likewise, the Low Contact property, exposed in a slide path, reflects Martin's famed persistence and tenacity, and how he embedded himself in a dangerous and perilous natural landscape. Finally, the Greenstone prospect and camp reflect how larger, better-capitalized corporations, such as the Alaska Copper Company and the Geneva-Pacific Corporation, pigeonholed Martin's prospecting knowhow in his twilight years. Indeed, the rationalization and scientific professionalization of mining after World War II rendered prospectors with his practical knowledge outdated. While the modern industry was still happy to examine the old-timers' claims and prospects, it increasingly applied the expertise of university-trained engineers and geologists to determine where and how to build mines in order to efficiently and profitably extract copper. For most of his prospecting life, Martin was completely dependent upon scientists to validate his claims, technocrats to mine them, and ultimately, absentee investors for the capital and ties to international markets to develop and sell the ore.
We can learn much from Martin Radovan. His story reflects boarder episodes and themes that shaped Alaska's past, such as the contributions made by early twentieth century immigrants; the role of big business and the Americanization of Alaska; the dependency of the so-called rugged-individual on science, industry, and corporatism; and, through his hard-working wife, Augusta, the role of women at mining camps. But in the end, Martin came to Radovan Gulch because of a dream - a dream which, in 74 years, he never achieved. "Martin was a prospector, and a prospector always has to believe there is something to find" (Green. 2010). "He was a prospector; he had a prospector's head…he never gave up" (Edwards, 2010). Indeed, Martin was an ordinary man who accomplished extraordinary feats. Although he never found his copper mountain, the real value of Martin's uniquely preserved properties is the history they can convey to visitors about a way of life in the Wrangell Mountains. To residents who knew Martin, or simply knew of him, Martin's value is his unwavering faith in his way of life, a way of life that local residents - ordinary individuals themselves - continue to seek in pursuit of their own extraordinary dreams. Anchorage Daily Times. 1951. "Brothers Reunited in Alaska after 50 Years," 7 November. Casley, Dan. 1972. "Venerable Sourdough Relates Alaskan Tale," Anchorage Daily Times, 4 November. Edwards, James H. 1965. "Martin Radovan" Alaskan Sportsman, September. _____. 2010. Interviewed by Katherine Ringsmuth and Dan Trepal, 7 July. Geneva Pacific. 1979. "Historical Review of Glacier Creek Area" Corporate report. Green, Gary. 2010. Interviewed by Katherine Ringsmuth and Dan Trepal 10 July 7. Green, Loy. 1994. "Life in the Wrangell Mts. & Meetings with remarkable Men & Women from 1963" Wrangell-Saint Elias News, 21 April. Moffit, Fred and Stephens Capps. 1911. "Geology and Mineral Resources of the Nizina District, Alaska." U.S. Geological Survey, Bulletin 448. Smith, Kenny 2006. "Martin Radovan Remembered," Wrangell St. Elias News, November and December. Spude, Robert, Dan Taylor, and Michael Lappen. 1984. "Historic Structures Inventory in Wrangell-St. Elias National Park and Reserve," National Park Service. Sykes, Thomas. 1980. "Prospector Martin Radovan," unpublished work. Radovan, Martin. circa 1974. Martin's Dream. Martin Radovan Private Collection, Chico, California. Ringsmuth, Katherine, 2012, Tunnel Vision: The Life of a Copper Prospecter in the Nizina River Country: US Dept. of Interior, 115 pages. Radovan, Augusta. 1930. Augusta Radovan's Journal, Martin Radovan Private Collection, Chico, California. Winkler, Gary, Edward M. MacKevett, Jr., George Plafker, Donald H. Richter, Danny S. Rosenkrans, and Henry R. Schmoll. 2000. "A Geologic Guide to Wrangell-Saint Elias National Park and Preserve, Alaska: A Tectonic Collage of Northbound Terrances." United States Geological Survey, Professional Paper 1616.